Version 1.4 adds seven new themes based on diamond and lens shaped branches, generating beautiful tesselations. Version 1.3 doubled the number of themes found in Version 1.2. Version 1.3 made the branching factor easier to change — A two-finger tap in the upper or lower half of the display increases or decreases the number of branches at each node in the Tree. Starting with version 1.3, a double-tap toggles the Perfect Common Ratio Mode on or off. Starting from its trunk, a geom-e-tree has the same number of branches at every node. This is the Tree's branching factor. 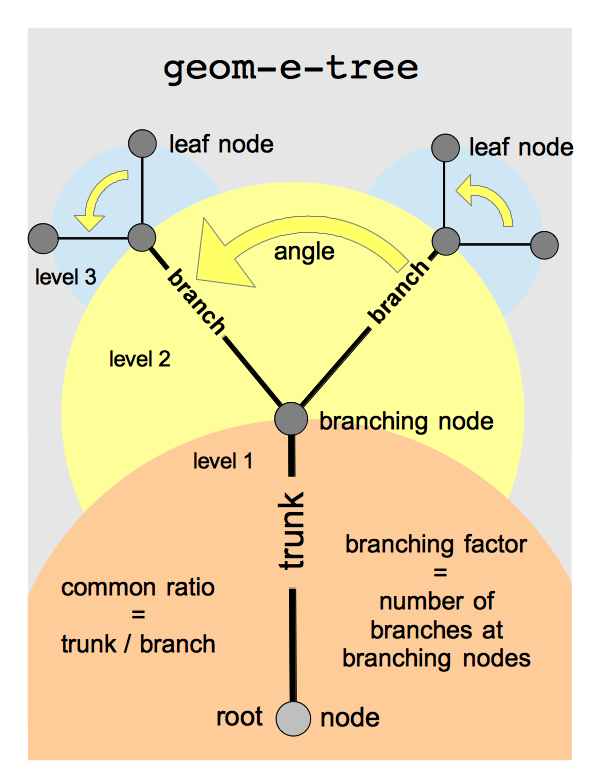 Branches at each node are separated by the same angle. The lengths of branches vary from one level to the next according to a common ratio. As a special case, when the common ratio is 1/1, the trunk, branches, and twigs are all the same length! Trees have many surprises. Geom-e-Tree 1.4, The App, provides an entertaining, educational, immersive experience of geom-e-trees. The first three sections explain how to use Geom-e-Tree — from using the basic gestures to really getting into it. To learn How to use this App , play with a Demo Tree while reading the first and second sections. When you're done with the demo, use a theme like Geometric Lite or Green Phosphor when following Help. As you gain familiarity with Geom-e-Tree, remember to review this Help from time to time. Your learning will progress through how to control a Tree using gestures, through gaining the ability to explore Tree space without getting lost, to Seeing the Forest . We invite you to relax and enjoy all the brain-stimulating patterns Geom-e-Tree has to offer. Geom-e-Tree responds to simple gestures. The entire display area can be used while gesturing. Geom-e-Tree has a special feature that can be toggled on/off with a gesture. 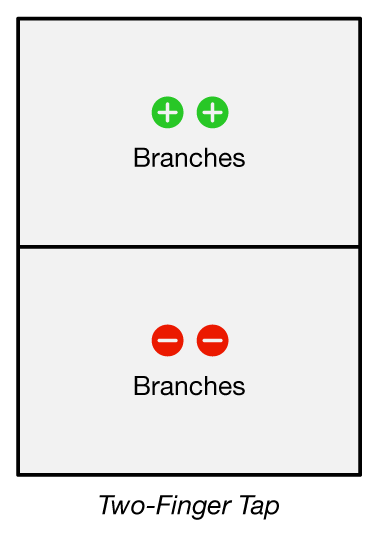 To change the number of branches at each node, use a two-finger tap on the upper or lower half of display — two fingers, one tap. This is a change from Geom-e-Tree 1.2. Two-Finger Tap in the upper half to increase the branching factor by 1. Two-Finger Tap in the lower half to decrease the branching factor by 1. The branching factor can be increased to 9 or decreased to 2 in this way. To continuously vary the angle between branches, move one finger up or down on the display. This is called panning. All angles in the Tree will change as you pan. Start anywhere — Pan up or down, and the angles will respond. Pan repeatedly (by lifting your finger) to change the angles a lot. 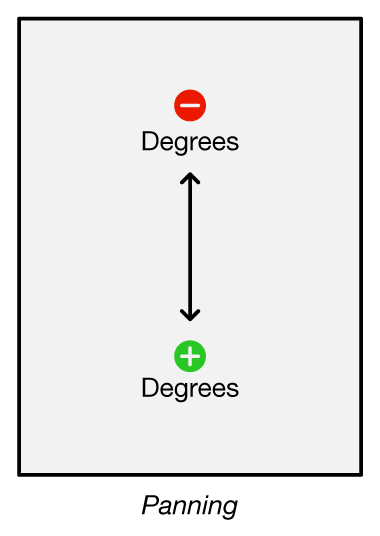 To change the Tree angle exactly one degree, use a single-finger tap. Tap in the upper half of the display to close the angles by 1°. Tap in the lower half of the display to open the angles 1°. Angles stop opening up at 359° and stop closing at 0°. To change the common ratio between the levels of branches, place two fingers on the display and either bring them together or spread them apart. Pinching a Tree generally results in complex patterns of overlapping branches. Think compression. Spreading a Tree generally makes a simpler pattern, one with less overlapping. Think rarefaction. Red prohibition signs on the display indicate that you can't pinch the common ratio any further. Tapping one finger twice in quick succession anywhere on the display immediately sets the common ratio so the branches will be as long as possible without overlapping each other (in normal conditions). A green border will appear when the Tree is in this mode. The Tree will stay in this mode until you double-tap again, or pinch or spread to take manual control of the common ratio. See the FAQ on our web site to learn more about this special automatic mode. This section has some exercises to get you familiar with Geom-e-Tree — to get you to think of it as a live object that responds to your gestures. Check the Tree tab, at the bottom left of your iPad or iPhone display to see if it has this 2-branched Demo Tree. The Demo Tree is intentionally simple so you can see the effect of your gestures. If the current Tree doesn't look like a Demo Tree, switch to the Themes tab and scroll down to the Demo Tree theme. Tap on Demo Tree. The current Tree will have the Demo Tree theme applied to it. Now play. Alternatively, you can find this simple Tree in the Arboretum. Double Tap on it and you should be good to go. Vary the angle between branches by panning up and down. Vary the ratio between the levels by pinching and spreading. Change the branching factor by using two-finger taps. Double Tap. Watch the Tree auto-determine the ratio as you change the angle. Try changing the Tree somehow, intentionally. Verbalize what you are doing and seeing. Play for a while, then explore some other theme(s). If you noticed the Demo Tree doing some strange things, see the next section! Did you sometimes see the number of levels change when you changed the number of branches? Explanation: The Demo Tree theme is limited to 60 lines for simplicity. The table shows the results of this constraint. In general, changing the branching factor always changes the Tree dramatically (even if the number of levels stays the same). The change is instantaneous. Did the whole Tree seem to move up and down? Did the length of the trunk change as you gestured? Explanation: Trees are dynamically scaled to fit on the display. Sometimes it's the width of the Tree that matters, other times it's the height. If this auto-scaling weren't done, you wouldn't see parts of the Tree — they'd be off-display! The Tree is also automatically centered as it changes. These things account for the movement. Did you notice when varying the angle that some branches moved up, while others moved down? Explanation: Try this - Start with a 5+ branched Tree, open the angle by panning down, down, down… open the angle a lot. As the Tree opens, you'll see some branches moving clockwise and others moving counter-clockwise. This results in the confusion — the branches are just passing each other on their way around. Now that you have the seen the basic gestures, learn how to use them effectively so you can play with the Tree. When pinching or spreading, be sure both your thumb and index finger make contact with the display at the same time, otherwise the Tree will only respond to one finger. For finer control over pinching and spreading, start with your fingers farther apart. You can move one finger or both in order to gesture. You can also use one finger from each hand for maximum spread. Geom-e-Tree doesn't respond well to wild gestures. Relax. You will have a more enjoyable experience if you let the Tree respond to your gestures — it needs more time to respond when its branches are hyper extended or it's casting long shadows. If you get lost, just double tap with one finger and the Tree will probably go back to a simpler, less overlapping pattern. The angle won't be changed. If the Tree doesn't change, then it's probably already in the Perfect Common Ratio Mode. (PCR Mode is indicated by a green border around the display.) You'll just have to unwind the Tree angle, or start over with a fresh Tree from the Arboretum until you can figure out what part of the forest you got lost in. Don't give up — geom-e-trees can be tricky! Consider checking the FAQ for help. A side-to-side gesture doesn't mean anything. The Tree may kinda look like it's doing something, but only the up-down component of a panning gesture is used. You may think that touching the Tree itself in some way does something. Nope. Only gestures on the display as described are meaningful. When single-tapping through a number of degrees, don't tap too quickly or you'll be double-tapping . See Setting and Unsetting the Perfect Common Ratio Mode. In addition to the eight permanent Reference Trees, you'll find a few interesting ones to vivify . Once the Tree is live, try changing the angle or ratio for a surprise. The Arboretum is described fully in its own section below. → Unless you change the branching factor, a Tree simply morphs from one pose to another as you gesture. Consider taking two tours , much like a knight tours a chessboard, to visit some special poses. Note: On both tours, you may need to single tap to adjust the angle in 1° steps in order to land on a certain pose. Before the tour… Note that a Common Ratio of 1.0 means that ALL branches will be the same length -- even though they are increasing in number at every level. At special angles, the branches align to form hexagonal, square, and isometric grids! The tour: Start with the binary Reference Tree from the Arboretum. (It's at 180° with a common ratio of ~1.42). Pinch it down until the common ratio is 1.0. You should see a simple square grid form. Now, pan up to vary the angle and you'll see the Hexagonal grid at 120°. Go back the other way (pan down), past the square grid you saw at 180° and you'll come to an inverted isometric grid at 240°. Side Trips: Pinch any grid all the way down to take a look, then spread to come back to the grid and continue your tour. You can make similar tours with higher order Trees (i.e. higher branching factors). Before the tour… A Common Ratio of 0.5 means that branches will DOUBLE in length from one level to the next in the Tree. As you vary the angle, the branches have to go somewhere. As it turns out, they form some simple, but deeply complex patterns. You would not believe us if we told you what you will see at 144°. To our knowledge, this was unknown prior to its discovery with Geom-e-Tree. Check it out. Color can be used for more than just making pretty patterns. The rainbow themes make it easy to see what level branches are on, no matter what pose a Tree is in. The black & white themes show even-odd levels. The Branching Order themes show left vs right branches in binary trees, left-middle-right branches in ternary trees, and so on. Colored Node themes (Fundamental Particles, Juggler) show the level of all Tree nodes regardless of their location. Each theme tells us something a little different about geom-e-tree geometry. Check them out! To Photos: Save a Tree in Photos and then handle it like any other image — use it in Apple's Cards app! To Mail: Geom-e-Tree can attach an image to a message for you to send. To Arboretum: Trees added to your Arboretum (see next section) can be viewed as a collection, or individually vivified at any time. Tip: You can switch to the Share/Save tab just to protect your current Tree from accidental change. Feel free to share a Tree on social media or math-related site where appropriate. It's OK to use a Tree for a derivative work (Needlepoint for example). If possible, please refer to Geom-e-Tree so people know where it came from. See Keeping the Trees Free below. The Arboretum is where you can collect and manage geom-e-trees that you like. 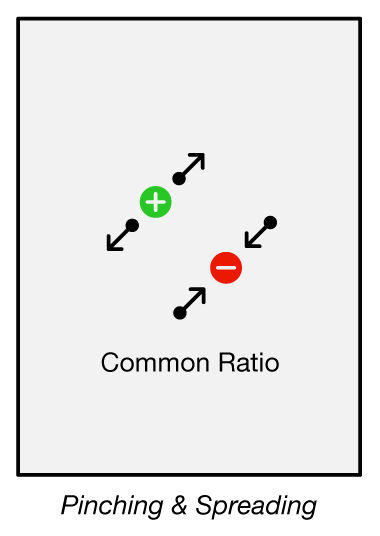 Everything about the Tree is saved, including whether it was in the Perfect Common Ratio Mode. You can examine, vivify (activate), or remove a selected Tree in the Arboretum. Double tap on a thumbnail to immediately vivify that Tree and switch Geom-e-Tree to the active view. The Arboretum will be unchanged, but the Tree you left in the active view will be displaced by the vivified Tree. Single tap on a thumbnail to pop up a larger view of that Tree, where you can vivify it or remove it from the Arboretum. We have stocked the Arboretum with eight fully-open geom-e-trees of 2-9 branches than can be used to instantly start a Geometric-themed Tree with the desired number of branches. Switch themes if you like. These first eight Reference Trees are protected from removal. The Arboretum can hold 384 Trees (increased from 256 in Version 1.2). You can vivify a Tree, morph it however you want, and then save that new Tree back into the Arboretum. If you want to change a previously saved Tree — vivify it, adjust it, change the theme, etc, and then add that Tree to the Arboretum. If you no longer want the original, go to the Arboretum, single-tap the original, and then remove it. If you got Geom-e-Tree 1.3 as an update, your existing Arboretum was updated to include Reference Trees for 8 and 9-branched geom-e-trees, and some removable sample Trees were added. If your Geom-e-Tree App was freshly installed, its Arboretum will have Reference Trees for 2 thru 9-branched geom-e-trees. New Arboretums will also have a few removable sample Trees to play with. See What's New in this Version. Themes are 'special effects' you can choose from the Themes tab at the bottom of the display. All effects are based on the same Tree geometry. The original version of Geom-e-Tree had plain black-lined Trees. The next version introduced themes with basically two coloring schemes for the lines — either a rainbow/spectrum theme or black & white theme for odd/even levels. In this version we introduce several new kinds of themes. The first new kind of theme shows the branching order of the Tree. 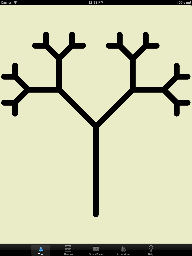 In the simplest case, a binary tree's left branches are white and its right branches are black. For higher order trees (branching factor > 2), we number the branches at each node 1, 2, 3… and assign colors to 1, 2, 3… so the branches are colored based on their left-to-right order at the node they branch from. This theme shows how the structure can curl around and fold up. Also in this version we introduce the notion of Allometry (scaling) by changing the thickness of the branches as well as their length as the common ratio is varied. These themes are quite striking, but it's impossible to keep an allometric-themed Tree from swelling up and engulfing the display at extreme ratios, so they are more constrained than other themes. It's best to think of these as 'beta' versions of these themes. See our FAQ. For something completely different, we have dot-based themes that feature the nodes of the Tree rather than branches. The underlying geometry is the same — the graphic rendition is different. These themes are incredible. You may see all the dots merge into just a few piles, or arrange themselves in groups. When you move away from those coincidences , the groupings explode and the dots move on their way to some other such arrangement / grouping. A variant theme (Fundamental Particles) colors the dots based on their level to produce patterns that beg explanation. Another 'beta' theme combines Dots with Allometry where structure seemingly materializes out of thin air as you pinch the display. Other themes (Circles, Wafers, and Rings) use the geometry of circles centered at the midpoint of each branch, with a diameter equal to the length of the branch! The most fantastic new theme (Dendritic Group Theory) combines plain dots with line segments or bonds at each node. Each node appears to point to the other nodes it's connected to. The bonds are color-coded by level, so you see nodes grouping together in various colored clusters, and zipping around to regroup as you vary the angle and ratio. It's as fun to watch as it is beautiful. The diamond and the lens are basic geometric-axial shapes that can represent the branches of a geom-e-tree. A lens is a lamina of two spherical arcs. We use symmetric lenses with a 60° arc. Our diamond is a rhombus of two 45° or 60° triangles. See Rhombus, Lozenge and Vesica Piscis on Wikipedia. What's New in Version 1.3 and 1.4? Briefly, we changed two gestures, and doubled the number of themes (~50) you can apply. The new gestures make the app easier to use; the additional themes give you a lot of new geom-e-tree space to explore. We increased the maximum number of Tree branches to nine. The new gesture for changing the branching factor made it easy for us to allow 8 and 9 branched geom-e-trees. Previously, a five-finger tap limited the number via gestures. We had 7 and 8-branched Reference Trees in the arboretum that could be used to get a Tree of those degrees, but that was a hack. The double-tap gesture now toggles the Perfect Common Ratio Mode on or off. A green border is displayed when a Tree is in PCR Mode. We added not just new themes, but new kinds of themes: themes that vary line width as well as line length, themes that draw thousands of dots at the nodes of the Tree instead of drawing branches, themes that draw nodes and branches, themes that draw nodes that vary in size, themes that draw circles at the midpoints of invisible branches, plus several other kinds of themes! For Version 1.4, we added seven new themes based on Diamonds and Lenses, built Geom-e-Tree for iOS7, and gave it a fresh new icon. Tree line widths now appear the same on all devices, and in arboretum thumbnail images, email messages, and photos. Previously, lines were not scaled consistently based on the image size. Dots (new in this version) are also scaled to match the image size. 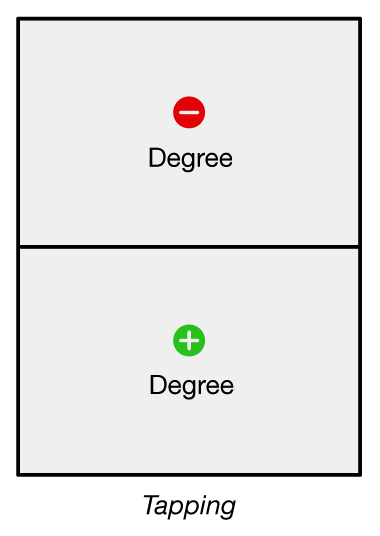 A red border used to indicate when the common ratio was being constrained. 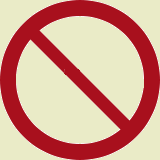 Now, red prohibition signs appear in both upper corners instead. We tweaked the Rainbow theme colors, rounded the end caps, and changed the light blue background to neutral gray. We added pivot rivets to the Pop Stick theme. The Arboretum was enlarged to hold 384 Trees. Let us know if you fill yours up. We tweaked the code and computations to enhance performance — always a good thing. When sending a Tree in Mail, the attachment is given a useful name. For example 2-180-1.618.jpg means it was a binary geom-e-tree at 180° with common ratio 1.618. This Help page and Geom-e-Tree.com were updated to reflect changes and to give you better information. A very helpful FAQ is on geom-e-tree.com. Some wild Geom-e-Trees are on our Explore page (~2MB). Our demo Geom-e-Tree in Action is on YouTube. See Videos. The original Geom-e-Tree (1980) animation is on YouTube. See Videos. Write to us: support@geom-e-tree.com. Your feedback is welcome. A printable Gesture Summary and Reference Sheet is also available on our web site. This same Help page is available on our web site for your reference. You can open it in Safari for printing. Geom-e-Twee (Twee) is the children's version of Geom-e-Tree. Twee has a dozen simple themes and draws Twees with 2 or 3 branches. It does not have an Arboretum. PolygonFlux (Flux) is based on Polygonal Billiards , an active area of geometric research. Flux generates some very mysterious patterns. In simplest terms, it traces the path of a point bouncing around inside a regular polygon of your choice. We like to say that PolygonFlux lets you experience the flow of energy inside a polygon. PolygonTrix (Trix) is a Math Art Game based on PolygonFlux. It's a digital arcade of angles and energy that lets you explore the Space-Time dynamics hidden in polygons. PolygonTrix is NOT a shooting game — it's an amusing geometric puzzler with a particle physics twist. PolygonJazz (Jazz) combines musical notes with billiards. Look for Jazz in January 2014 and Listen to the Polygons . We will release MacOS versions of Tree and Flux as soon as we can. You can always find our current apps and other news on our mothership site: Time Haven Media Company. Are you in a non-English-speaking country? Are you an artist seeking some kind of permission? A developer looking to imitate? ...but please forgive our lack of Internationalization. We appreciate the friends we have in France, Germany, Spain, Italy, Japan, and other countries. Someday we hope to be able to afford professional translation of this Help and the FAQ into five or more languages and have those appear directly in Geom-e-Tree. Until then, we have provided links on our support page for Google translations. See translations for French, German, Spanish, Italian, Japanese, etc. All simple, plain-color fine-lined patterns produced by Geom-e-Tree are natural mathematical forms, and therefore are in the public domain. We only ask that any commercial or artistic use of a geom-e-tree produced by Geom-e-Tree adhere to the Creative Commons Attribution License Conditions, stating clearly that the pattern came from the Geom-e-Tree iPhone or iPad application. Please see Creative Commons About Licenses. The Geom-e-Tree™ and Geom-e-Twee™ apps themselves are ©2013, by John Miller, Portland, Oregon, USA, and their app names are trademarked. These apps will have features added in later versions. We really don't want to see copycat variants of our basic design. We ask other developers to respect our right to improve Geom-e-Twee and Geom-e-Tree, and challenge them to come up with their own creative ideas to enrich the electronic playground and classroom. Thanks!